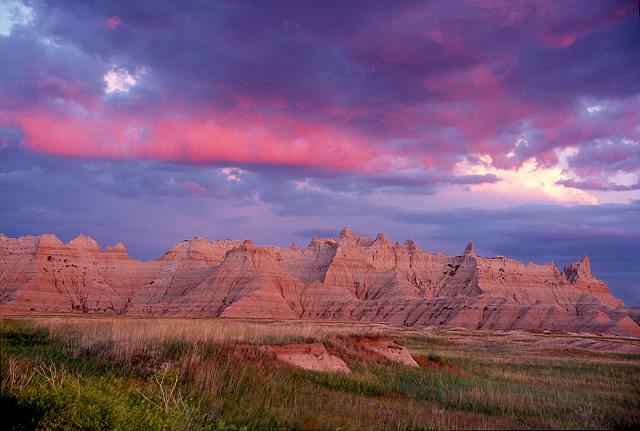 Badlands National Park features dramatic landscapes spanning layered rock formations, steep canyons and towering spires. Bison, bighorn sheep and prairie dogs inhabit its sprawling grasslands. 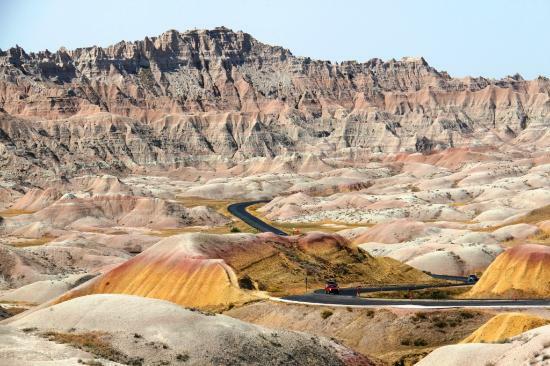 The 240, 000 park is located in South Dakota, 75 miles east of Rapid City. The park is a popular destination in summer. Most people see the park by driving the 30+ mile scenic drive. 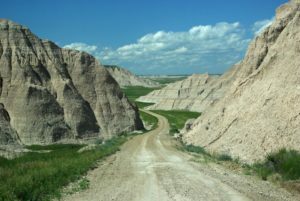 The best places for running in Badlands National Park are along the Badlands Loop Scenic Highway, Sage Creek Rim Road, and some of the hiking trails. The most popular spot for running is the Castle Trail, 5 miles of level, scenic running free of cars. At the southern end of the park, Sheep Mountain Table is gorgeous for running. The Visitor Center is at the eastern end of the park. Note the park can get hot in summer and the distances can be significant. Please be aware of traffic on the park loop roads, as the shoulder is inconsistent. There is no public transportation or shuttle in the park. Be aware of wildlife, especially bison. A two-lane paved road through the north unit of the park, connecting Rt. 90 at either end. The part of the road within the park is 26 miles. There are 30 scenic overlooks along the road. Run anywhere along the road, or coordinate with a partner to shuttle you for a one-way run. A particularly nice spot is in the Dillon Pass area, toward the Conata Picnic Area and Deer Haven. Several steep passes involving an elevation change of 250 feet in less than 500 meters. Note there are sections where the road is narrow and there can be traffic and RVs. Run opposite to traffic. 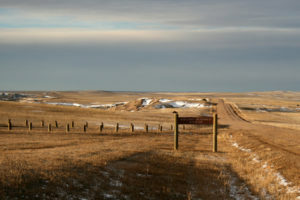 A gravel route along the northern edge of the Badlands Wilderness Area, past Roberts Prairie Dog Town, and includes a section through the oldest exposed layers of the White River Badlands. Do any section by pulling out along the road or from the Sage Creek Campground. The entire road is 22 miles one way. Wildlife is abundant, including the American bison. Use caution. Watch for ruts and loose gravel. Sage Creek Rim Road may experience heavy traffic during the summer months and can be dusty. The longest trail in the park begins at the Door and Window parking area and travels five miles one way to the Fossil Exhibit Trail. Relatively level, the path passes along some badlands formations. This generally rolling trail connects with the Castle Trail near the Old Northeast Road and at the intersection of the Castle and Saddle Pass Trails. This trail is an opportunity to explore the mixed grass prairie, while enjoying views of the Badlands in the distance. The trail is a 4-mile loop, but will likely incorporate part of the Castle Trail. A wonderful spot for running in the southern unit of the park. A gravel road, away from the traffic. The road starts 5 miles south of Scenic (Rt. 44), and continues up to 7 miles to the end, crossing into the park and bordering Pine Ridge Reservation. Best to do a few miles and turn back. The first 3 miles are fairly flat, then there’s a steady climb, up to 580 feet elevation gain over the last half. Pleasant gravel trail from the Conata Picnic Area to the Wilderness area along the Deer Haven trail. This trail can go for several miles. Asking questions are really good thing if you are not understanding something entirely, but this post provides pleasant understanding even.